Coupe vintage glasses with frosted leaves decoration - set of 2. 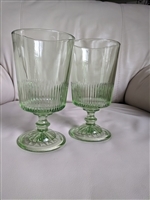 Goblets in green glass and Art Deco style, set of two. Martini glasses, set of 3. Vintage, thumbprint with decorative stem drinking glasses. Diamond Point Clear by Indiana Glass salt and pepper shakers. Aqua glass embossed salt and pepper shakers. Footed Sugar Bowl & Lid in Windsor-Clear by Jeannette. 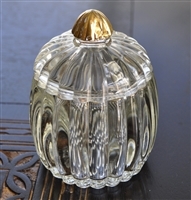 Vintage lidded jar with gold accents, ribbed design. 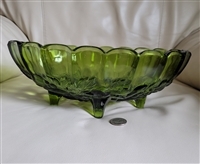 Depression green glass footed bowl with scalloped edges. Westmoreland Poppy Flower milk glass plate. Vintage GODINGER Silver Art co. cobalt blue bottle salt and pepper shaker. Colorful Cordial glasses - vintage glass, set of 4. PEPSI, 1978 collector SHAZAM ! glass. Pedestal sherbet in trapped bubbles green glass. Flanders Clear by Silver City salt and pepper shakers set. L. E. Smith Glass double light candle stick. Depression glass pedestal candy dish with lid. Gold color accents. Stained glass multicolor storage box, vintage hand crafted decor. Vintage milk glass pedestal Banana Cake tray, diamond pattern.